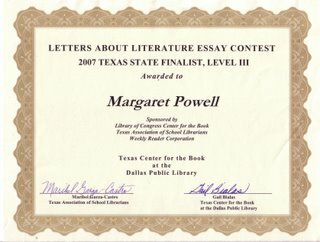 I used to beg certain people in our family to enter the Letters about Literature contest! 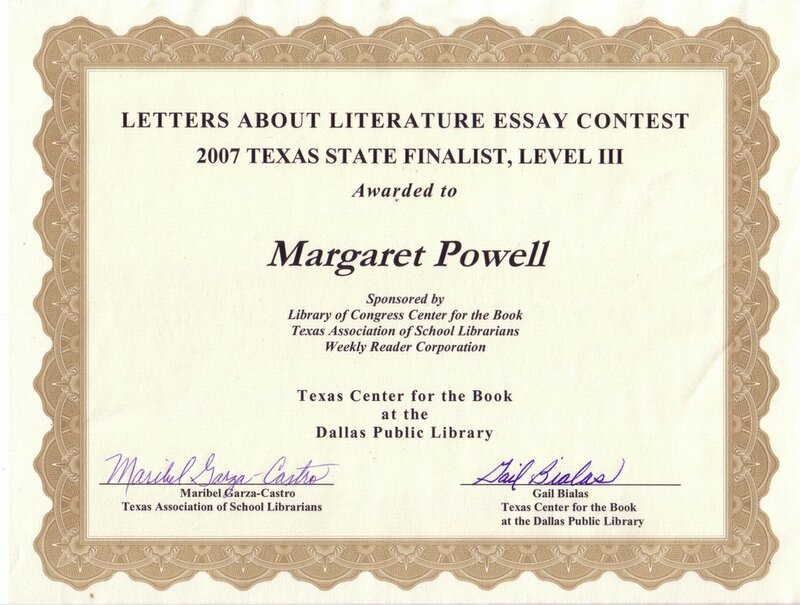 M received this nice letter and certificate yesterday. "I caught you a delicious bass." Brian and I went out to Lake Grapevine Saturday morning to join Brian's dad, Gary, in small fishing expedition. It was my first time holding a fishing pole without a picture of Mickey Mouse, and I have to say it went pretty well. Out on the water by 7:30 a.m., we chased small flocks of birds around the lake for three hours. 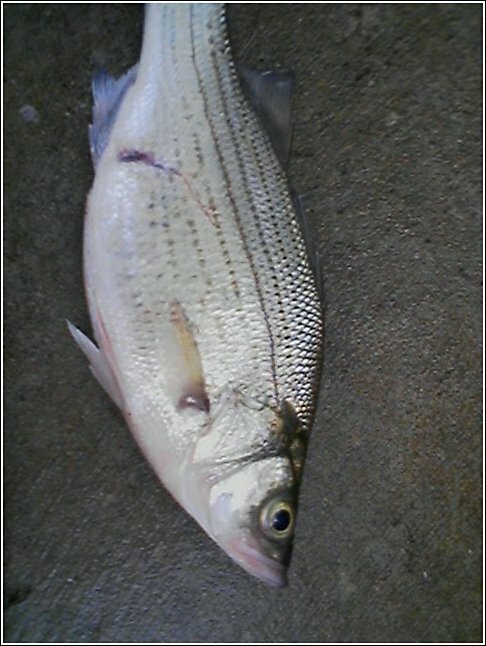 The white bass we wanted eat minnows and other small fish called shad. Schools of bass eat early in the morning and drive the shad, etc. up toward the surface where birds swoop down and attack from above. Follow the birds, find the fish. Of course I didn't have any idea what I was doing so Mr. Fox and Brian helped me out a lot. I picked a silver lure since it was sparkly, and they cast for me almost all morning. Turns out, when I don't have to do any of the work, I'm pretty good. In fact, the first time I held the pole I got a bite. After a lot of: "Uhh ohh, uhhhh ohhhh, uh guys, ohhhh! Help! Yikes! Guys!" I somehow managed to "reel in" the fish. He was probably a whopping 8 inches long, maybe one pound, but I'd caught a fish! I probably caught 11 or 12 fish total. One of the boys always picked them up and took out the hook. We threw around half back, since they were too small. Once we wrapped it up, I had six fish to take home. The guys didn't have my luck -- Brian caught five and kept three, and Mr. Fox caught three and kept two. In all fairness, they probably would've caught a lot more if they hadn't been casting for me all the time. (Not that we kept score or anything...11 to 5!!!!). Brian taught me to cast on our way back to the boat ramp. By the time we pulled in, I could cast a decent distance. Mr. Fox said I was a natural fisherwoman and teased Brian the rest of the day for letting me catch more than he did. Back at the homestead, Mr. Fox "cleaned" the fish in the driveway. They made me watch once they realized I'd managed to avoid touching a fish all day, but I won't recount the nasty, icky, gooey, gross, sticky, slimy, bloody, gooey, icky, nasty details. 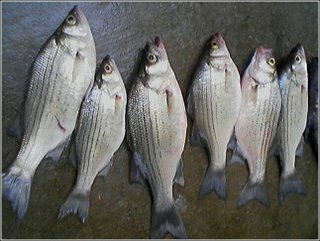 We had yummy bass fillets for lunch, some blackened and some seasoned with a good tequila-lime rub. Can I get another "Hallelujah!" Brian and I had a wonderful opportunity to drop in on an open rehearsal of the Dallas Symphony Orchestra last week. Claus Peter Flor, the symphony's principal guest conductor this season, worked for three hours with both the orchestra and the Dallas Symphony Chorus, perfecting Handel's Messiah. Every musician had a pencil at the ready, bringing back memories of high school wind ensemble rehearsals. Notations, edits to the score and scolding the brass players in the back to pay attention - all very familiar. I didn't know a lot about Messiah besides the traditional "Hallelujah Chorus" so I made a quick Wikipedia stop before attending the event. Things I didn't know: The Messiah was composed in the late 1740s in less than 30 days as a way for Handel to get out of debt. He conducted the composition several times, continuing to adjust and edit the score before each performance. Interestingly enough, because of those alterations, no single version of the Messiah is regarded as the one and only authentic version. Other arrangements and variations were added in later centuries by other composers, including Wolfgang Amadeus Mozart who translated the Messiah into German. I received tickets to the invitation-only open rehearsal through The Dallas Morning News, one of the symphony's bigger sponsors. It would have been worth at least a dollar though, had these esteemed muscians added a Kazoo Choir like the interpid students at Northwestern University.